How to keep candlelight processions safe? With Christmas fast approaching many churches are planning traditional Christingle celebrations and candlelight processions. Children and adults will decorate oranges with red ribbons and dried fruit ready for the parade and lighting of the central candle. It is a nostalgic and humbling sight seeing the Christingle procession, reminding us what Christmas is truly about. With this, though, comes the headache of the fire safety assessment. How to prevent injury should clothing accidentally become ignited by the naked flame of the candles. Many rely on fire blankets to wrap around the person and rolling the person on the floor to smother the flames. Clothing is often still made of highly flammable materials that catch fire quickly. Whilst using a fire blanket is of course the most traditional form of dealing with a clothing fire it is not the most effective way to extinguish a person’s clothing. A water mist fire extinguisher is by far the best method to extinguish such a fire. It contains only de-ionised water and is therefore safe to use in close proximity to people and animals. The special nozzle disperses the water in a fine spray, preventing the clothing from being wafted away from the person and potentially spreading to others. The mist is also harmless if sprayed onto a person, even if sprayed on their face or burning hair. The mist also forms a safe buffer between the fire and the person using the extinguisher. Our water mist extinguishers are also suitable for every other form of fire, including fat fires and liquid fires. To see the water mist extinguisher in action please view this video. These extinguishers are available in 1ltr, 3ltr and 6ltr models and are 100% environmentally friendly. Not only are they suitable to be used on a person there is also no mess to clear up afterwards. Waterways World, Britain’s best selling canal and river magazine features both the Britannia Self-Maintenance fire extinguishers and the Jewel Dry Water Mist fire extinguishers in the Boats & Pieces section of their April edition. Boats & Pieces features new products and ideas that are useful for boat owners. 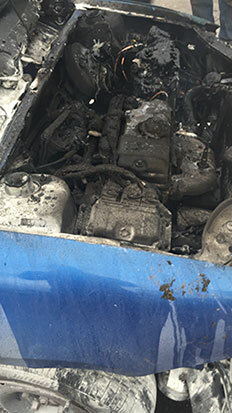 The article goes on to say that the Britannia extinguishers meet all the Boat Safety Scheme requirements and that the self-inspection possibility of these extinguishers can save boat owners over £300. The second range of extinguishers reviewed, the Dry Water Mist extinguishers use a brand new technology which makes them suitable to tackle both A, B and F rated fires (solids, liquids and pan fires). Whilst currently only certified for A and F risks, the water mist extinguishers also work very well on B class fires such as burning petrol or diesel. The extinguishers even extinguish gas fires and are safe near electrical risks. The portable water mist extinguishers are ideal for areas where space is limited, such as boat kitchens and cabins, as there is no risk of inhalation of extinguishing medium. Small boat cabins make the use of traditional powder extinguishers unthinkable, as the fine powder would be inhaled. If you would like more information on either the Britannia self-maintenance fire extinguishers or the Dry Water Mist fire extinguishers, please do not hesitate to contact our customer care team, Freephone 0800 612 6537. Alternatively you can e-mail any enquiry to support@safelincs.co.uk.